Social discovery-focused startup 1Mind is launching today driven to help users find companions with similar interests and personalities. Akin to a blend of Match.com meets Sonar meets Polar, the company uses an algorithm to help you find new friends based on answers you’ve provided in a series of questions. The service kicks off today with its Web, iOS, and Android apps available for public use. Started by the tag-team duo of brothers Derek and Darren Dodge, 1Mind acts like a personality test and then shows you that someone like Ashton Kutcher or maybe TNW’s Martin Bryant is just like you because you have a strong affinity for Shiba Inu pups. If the Dodge’s last name sounds familiar to you, then don’t be surprised as the founders are kin to Don Dodge, investor, entrepreneur, and developer advocate for Google. Those interested in the service can log in using their Facebook credentials and begin participating in a series of games, which are basically questions that you answer (thus the Polar angle). When you begin looking through the site, it will ask you to invite your Facebook friends, although it’s purely optional. In addition to that, you can view other polls/questions that others have asked such as “How do you communicate?” and it shows an iPhone or two tin cans tied together with a string (I chose the latter). 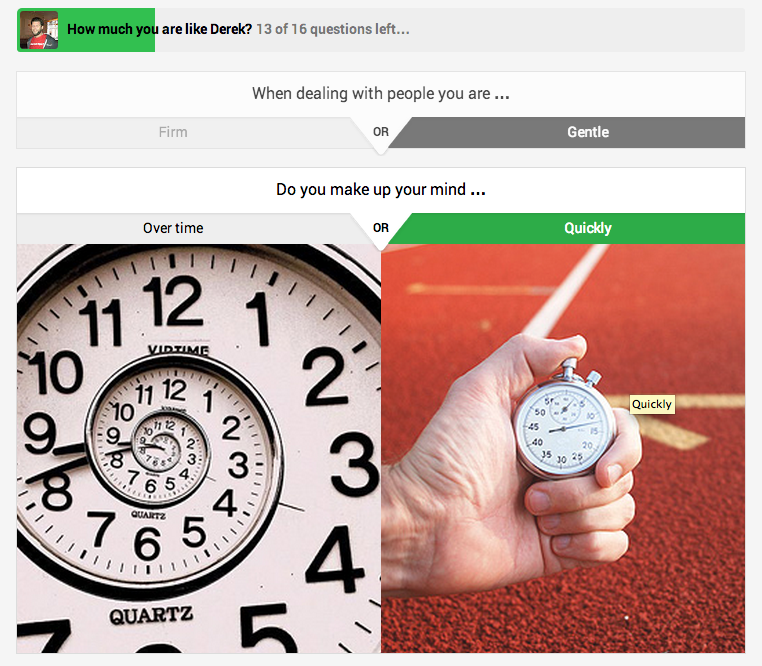 Each question that you answer includes features to further express your opinion. By this we mean you can give it a “thumbs up” if you really liked the question, share it to Facebook and Twitter, or leave a 140 character comment to elaborate on your vote. 1Mind offers two basic modes: vote or discover. 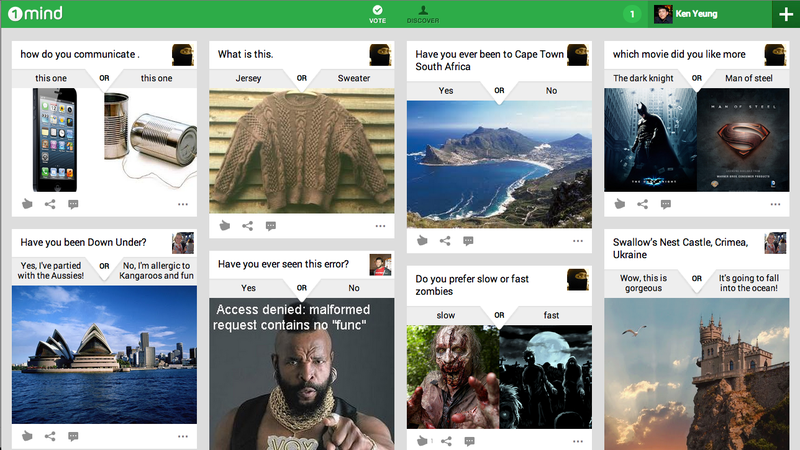 With vote, users can offer their opinion about certain questions, like which movie was better? The Dark Knight or Man of Steel? With the other mode, it will display users based on their likeness score — almost like Klout, but specifically focused on how similar they are to you. How exactly is a likeness score calculated? 1Mind says that it’s a combination of your personality type, votes you made in the app, and your Facebook profile data. Each of these are weighted and updated the more you engage with the service. 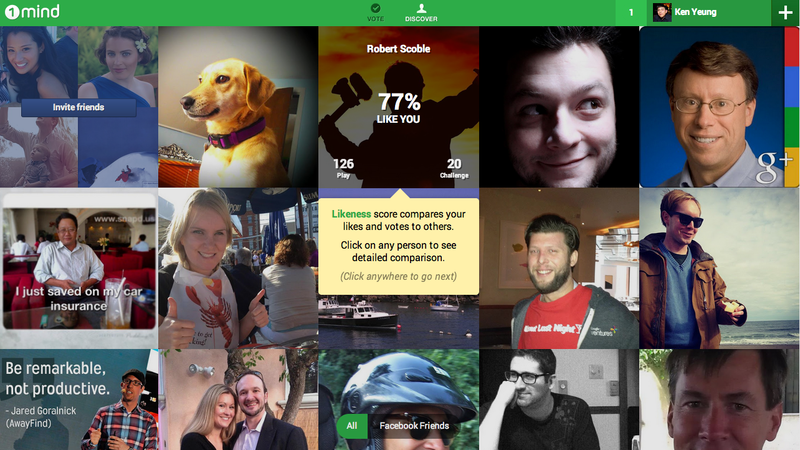 If you click on an individual profile, it will provide a comparison on how alike you are to them. 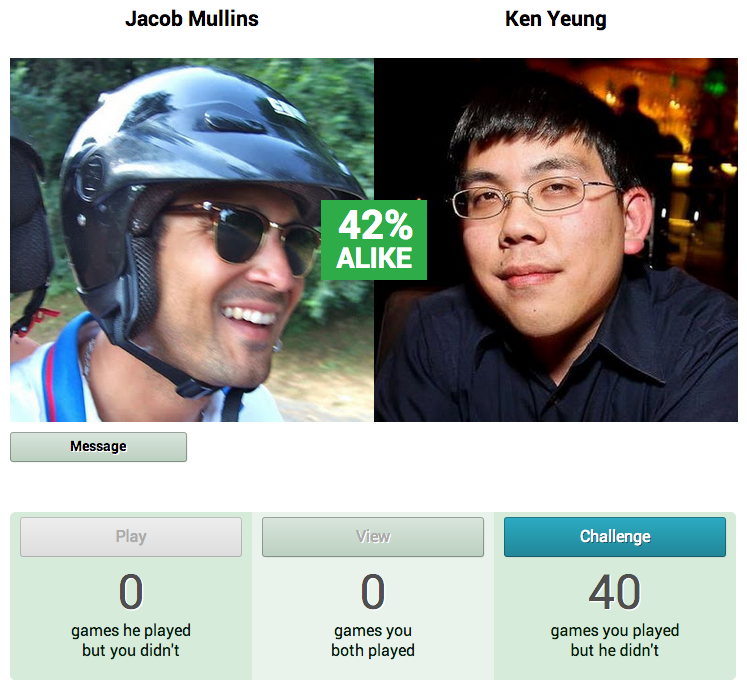 1Mind apparently says that Exitround’s CEO Jacob Mullins is 42 percent alike to me. But at the same time, I’ve been answering questions inside the app and he has not — so if he logs in and answers questions he finds interesting, perhaps that percentage will increase. 1Mind also shows the personality type and how different you are to other users, such as saying who is more extroverted, intuitive, emotional, and perceptive. In a sense, it’s a more analytical representation of your “friendship” than what you would be shown if you looked at your Facebook connections. However, it’s in this part of the service where you can connect with those that have a high likeness score. From there, you can browse further down and see the people that are like them and potentially connect with many others as well (think “Six degrees of Kevin Bacon“). While an interesting endeavor, there will those who equate 1Mind with being a matchmaking service — perhaps the social version of eHarmony.com? And this is something that the Dodge brothers don’t dispute. They readily admit that this service could be used by people to form romantic relationships. However, they are adamant that 1Mind’s true mission is to help you express your interests and discover those that have the same desires, whether it’s handgliding, snowboarding, knitting, programming, or rooting for your favorite sports team. So what’s going to get people to come back to this app repeatedly? After all, it does appear to be in a crowded field, competing against the likes of Thumb and Polar. 1Mind is a mishmash of various services including Klout, Polar, Match.com, and Facebook. The company believes that people will feel compelled to return because it allows you to create your own game and express yourself in any way you want. In addition, as much as it’s tied to Facebook, 1Mind thinks that it will truly help you discover new people while the world’s biggest social network will connect you to those you already know. 1Mind has raised $500,000 led by 10x Venture Partners, eCoast Angels, and included participation from the company’s friends & family. When asked about its revenue source, the Dodges shared that while it’s not focused on monetization right now, the company may introduce contextual advertising — that is, ads displayed in connection to what a user is doing, along with offering virtual goods or premium services. So what’s happening with the company’s other startup, About Last Night, the social network that blends Path with the ephemeral parts of Snapchat? We’re told that the service is still up and running, but the team’s entire focus has been on getting 1Mind launched. 1Mind was started by Derek Dodge back when he was in college. He says that with thousands of students on campus, he only knew those in his dormitory or in his classes, but didn’t know if there were more that had similar interests. So the company was started to answer this plaguing question. It has brought on advisors like recording artist and entrepreneur MC Hammer and, of course, Don Dodge. And speaking of the man who brought us “Too Legit To Quit”, he has created his own personality test that users can take so users can see how compatible they are with him.